THE PORT OF INDIANA-BURNS HARBOR: The port recorded the second-highest cargo total for a January-to-September this year. Port Of Indiana-Burns Harbor expansion will increase cargo handling capacity and multimodal capabilities. Indiana port expansion will include construction of a new cargo terminal with multimodal connections. Indiana port expansion will include adding 4.4 miles to the existing 14-mile rail network. US Secretary of Transportation Elaine L. Chao has confirmed the Port of Indiana-Burns Harbor will receive one of the nation’s 10 FASTLANE small project grants for 2017. In August, Chao informed Congress the Department of Transportation was recommending approval of a $9.85 million discretionary grant for the port. After a 60-day review period, the House Committee on Transportation and Infrastructure and the Senate Committee on Environment and Public Works approved all the projects. The port’s grant is part of a $19.7 million expansion of the infrastructure that will increase cargo handling capacity and multimodal capabilities. 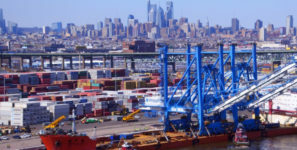 The port expansion will include the construction of a new 2.3-acre cargo terminal with multimodal connections for handling cargo transfers between ships, barges, rail cars and trucks. In addition, 4.4 miles will be added to the port’s existing 14-mile rail network. Two new rail yards will create rail storage for 165 rail cars, accommodate a 90-car unit train and provide rail car switching within the port, which will improve operating efficiencies for port companies. Improvements to the west dock, including extending a retaining wall and paving a dock apron, will result in an additional 1,200 feet of usable dock space. The project scope also includes a new six-acre truck marshalling yard that will relieve congestion along port roads. The Port of Indiana-Burns Harbor handled nearly 2.6 million tons of cargo in 2016, completing the highest three-year total in the port’s history. Ship traffic through the port was up nearly 20 percent for the first nine months of 2017, while total shipments were up nearly 11 percent, compared to the same time period last year. The Port of Indiana-Burns Harbor opened in 1970 and serves the largest steel-producing region in North America. Major cargoes handled by the port include steel, coal, limestone, fertilizer and grain. Port operations generate an economic impact of $4.9 billion per year and support over 39,000 total jobs. The port handled two million tons from January through September of this year, recording the second-highest total for that nine-month time period and also the second highest September in the port’s history. Overall shipments for the first three quarters of 2017 rose nearly 11 percent while steel cargoes were up nearly 49 percent, oils up 40 percent and grains up nearly 14 percent, compared to last year. Ship and barge traffic were both up 20 percent during the first three quarters. Shipments included Midwest soybeans headed to Spain and several vessels carrying over-sized cargoes, such as windmill components and ICARUS, the world’s largest liquid argon particle hunter and the most valuable piece of cargo ever handled at the port. The multi-million dollar instrument was shipped from Geneva, Switzerland, to Fermilab in Batavia, Ill.